Dr. Paul Roebber is the Founder of Innovative Weather, Professor of Atmospheric Sciences in the UWM Department of Mathematical Sciences, and Associate Dean of the UWM School of Freshwater Sciences. His research in synoptic meteorology has led to improvements in operational tools used by the National Weather Service, Weather Eye, Inc., and WE Energies. 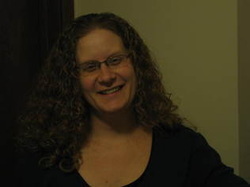 Dr. Roebber’s background includes experience in mesoscale numerical model prediction, private forecasting, and editing the journal of Weather and Forecasting. He has been the recipient of the American Meteorological Society’s Editors Award, the UWM Research Foundation Senior Faculty Award, and the Distinguised Undergraduate Teaching Award. 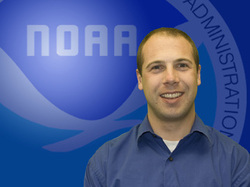 Mike Westendorf is the Director of Operations for Innovative Weather. His responsibilities include managing daily forecast services, training staff members, recruiting clients, and maintaining program sustainability. Westendorf graduated from UWM in 1996 with a BS in Atmospheric Sciences, and went on to complete his post-undergraduate research on high-resolution modeling and radar analysis with Dr. Roebber. His experience includes roles as Director of Operations at Weather Eye, Inc. and Severe Weather Assistant at WTMJ4, Milwaukee’s NBC affiliate. Mike enjoys spending time with his wife and three children. He is also an accomplished singer/songwriter. My experience at Innovative Weather started in October of 2009 as a meteorologist, but I’ve taken on programming responsibilities over the past year. 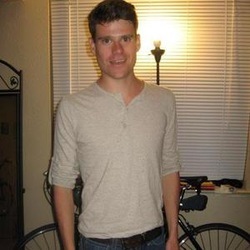 I graduated in August 2011 from the UWM Atmospheric Science program, and am currently taking computer science classes as a non-degree seeking student. I decided to go to UWM because of how close it was to home, along with the tuition price compared to out of state costs. I have a general interest in anything technological or science related, and enjoy a good run along with watching sports in my spare time. Like many of my coworkers, I’ve had a general interest in weather for most of my life, but I remember driving through a storm when I was 12 and it could accurately be described as one of the most memorable and terrorizing experiences I’ve ever been through. I graduated from UWM in May of 2012 with a B.S. in Atmospheric Science, and have been with Innovative Weather since March of 2011. I started out studying electrical engineering, but decided to pursue my lifelong passion after learning about the Atmospheric science program here. In the future I’d like to go to graduate school with an emphasis in social science in meteorology and helping people further understand the risks severe weather poses them. In summer you can find me spending as much time outdoors as possible, and in winter local ski hills are a typical hangout. I started at Innovative Weather in May of 2011 and graduated a year later with my bachelors in Atmospheric Science. I’ve recently started graduate studies at UWM, and after I earn my masters degree I’d like to work for the National Weather Service. I’ve always been interested in weather, but it wasn’t until college that I made it a reality. When I originally chose UWM, I did so because of the great faculty at a close to home university. I enjoy working here because of the real life forecast experience and the realization that we save companies money by delivering accurate forecasts. 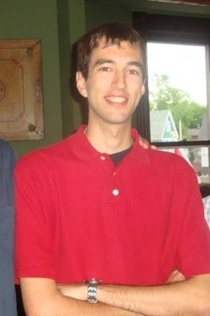 My biggest interests in the field are studying short range high-resolution mesoscale models and going storm chasing, but I also enjoy disc golfing, and playing guitar and basketball. I graduated in May from the UWM Atmospheric Science program, and have been with Innovative Weather since November of 2011. I’ve been a weather enthusiast since grade school, and I chose UWM because it is one of only three schools in the state with an atmospheric science program, and the only one to offer forecasting internship opportunities. Graduate school is in the cards for the fall of 2013, likely with an emphasis on Mesoscale and Synoptic research with a focus on applications to operational meteorology. I’m an avid music and baseball fan, and can often be found in the summertime at Miller Park or at various Milwaukee festivals. I’ve only been with Innovative weather since November of 2011, but I’ve been interested in meteorology since I was a small child. I chose UWM because it has a strong Atmospheric Science program, and is one of the few schools to offer an in-depth internship program in operational forecasting. The most appealing aspect of Innovative Weather, and also the most challenging, is that the students are the ones issuing the forecasts and making the decisions. 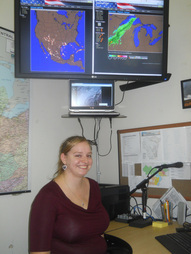 The program really develops you not only as a meteorologist, but also as a young professional. Beyond meteorology, I enjoy reading as well as engaging in outdoor activities. I plan on graduating in May 2013. I’m set to graduate with my bachelors in May of 2013, and I started at Innovative Weather in January of 2012. After graduation I’d like to work in a similar environment providing forecasts to private clients, though I haven’t ruled out broadcasting as an option. I really enjoy the working environment here; it provides an opportunity to hold a large amount of responsibility, as well as a method of applying my coursework. I’ve always been interested in weather, and I decided to attend UWM because it is one of only three schools in the state that offer an atmospheric science degree, and it’s fairly close to home. In my spare time I enjoy attending Brewer games and I often spend time up north relaxing on the lake. 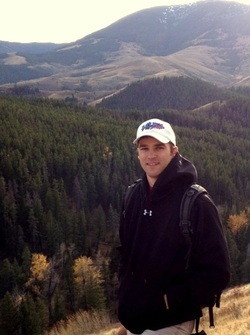 I am currently a senior in the UWM Atmospheric Sciences program and will graduate in May 2013. I have been with Innovative Weather since December of 2011. Since I was very young, I have always been interested in the weather. During thunderstorms, I would hang out in the garage to watch until my parents yelled at me. When I was in 4th grade I got to tour WTMJ and I met John Malan, and I got to interview a National Weather Service meteorologist my sophomore year in high school. After I finish my bachelor’s degree, I plan on attending graduate school in hopes of pursuing a career as an operational meteorologist for the National Weather Service. I enjoy working at Innovative Weather and like that it provides real life experience for students and gives us the opportunity to work in the field and get our feet in the door. I graduated from the Atmospheric Science program in May of 2012. My interest in the field of meteorology was sparked when I was in middle school and debris from a tornado more than 60 miles away started to fall into my back yard. It made me think about the processes of changes that our atmosphere goes through every second and how pieces of debris can be lifted, and dispersed so rapidly and over such a distance. 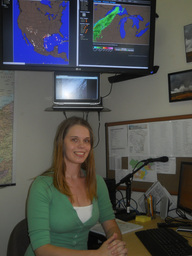 I was an intern at Innovative weather from June 2011 – January 2012 and have started up again as a Meteorologist as of August 2012. My main goals in the field are to be doing work similar to what I do here at Innovative Weather as an operational meteorologist; however in the short term I will be going back to UW-Milwaukee to pursue my Master’s degree in Atmospheric Science in the spring of 2013. My main reasons for coming to UWM were because it was close to my home and that through Innovative Weather I could potentially receive valuable experience in this field, as well as in life. I will graduate in May of 2013 with a degree in Atmospheric Science. I have been interested in weather for as long as I can remember. The weather is always changing and to me that's a job that I will never get bored with. I started at Innovative in the summer of 2012 as an intern, and it has already taught me a lot about forecasting. After I graduate I hope to get a job in operational forecasting, and working at Innovative is a great tool to make that dream a success. Besides going to school and working at Innovative, I also enjoy working at New York and Company, playing tennis, and taking the time to read a good book. 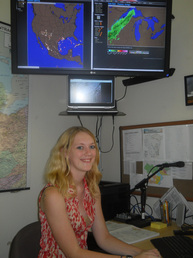 I’ve been a student at UWM since 2009, and an intern at Innovative Weather since June of 2012. When I was a small child I remember driving near an F5 tornado, and I’ve had a special interest in weather events ever since. I was reaffirmed of my desire to pursue meteorology as a career choice after flying in a plane through a tropical storm in Florida at age 15. I decided to attend UWM after hearing of the IW program in high school, and because it allows me to commute easily from home. After graduation, I intend to attain a master’s degree in atmospheric sciences, and have hopes of working for the National Weather Service someday. When I’m not working on schoolwork, I’m an avid cook, and love to create meals for my friends and family on a regular basis. I’ll be graduating in the spring of 2014 from the Atmospheric Science program, and started working with Innovative Weather in August of 2012. I started at UWM as an undecided freshman, but have been interested in meteorology since grade school. It goes without saying that the movie Twister was one of my personal favorites. Midway through my second year, after gathering information about the Atmospheric Science program at UWM, I decided Atmospheric Science was the way to go. Upon graduating I hope to get a job working for the National Weather Service, but I’m also considering furthering my education and working towards getting a Masters degree. I’m a big football fan, love watching and rooting for the Packers, and also enjoy kicking back and jamming on the guitar or bass. I will be graduating from the UWM Atmospheric Science program in the spring of 2014 with minors in math and French. I chose UWM because the Atmospheric Science program focuses on the mathematics behind atmospheric processes, and it provides many opportunities to students. I have been with Innovative Weather since the summer of 2012 and am likely to continue on to graduate school after graduation for further studies in Mesoscale research. My interest in weather began in 4th grade when a funnel cloud passed over my school, and that interest became a passion when Hurricane Charley impacted my home two years later. 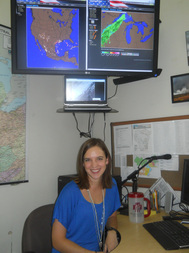 I recently joined the Innovative Weather team in August 2012. I’m looking forward to graduation in May 2014. After graduation I plan on going to graduate school to hopefully study severe weather or tropical weather. I am, however, keeping my books open for other potential studies. As a child I’d always watched the local news with my family and idolized the meteorologists. I began studying pre-medicine at Concordia University, but after taking an Introduction to Meteorology course with Mark Baden from WISN, I was convinced that I should take it on as a major. I soon started taking math courses at Concordia University and eventually transferred over to UW-Milwaukee in the summer of 2011. I decided against UW-Madison because of its large size in the program, and after meeting with faculty from UWM and Iowa State, I decided to go with UW-Milwaukee because of class sizes and tuition rates. Mike Kurz can trace his interest in meteorology back to grade school and remembers being amazed at the destruction left behind by an F3 tornado that ravaged Wautoma in 1992. As a middle schooler, Mike resolved to become a meteorologist after repeatedly borrowing all of the library's tornado videos. 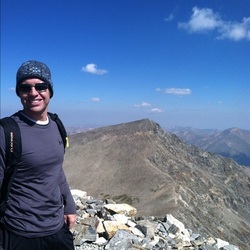 His interest in weather grew exponentially through college, and he received both his Bachelors (2007) and Masters (2009) degrees in atmospheric science from UWM. Right out of high school and through graduate school, Mike interned at WTMJ, where he had the privilege of learning from Milwaukee meteorologist legends John Malan and Paul Joseph. 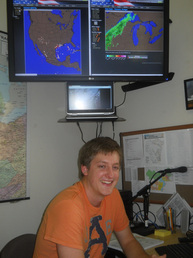 Additionally, Mike was one of the original Innovative Weather forecasters when the operation began in May 2007, and he remained with IW until January 2010 when he accepted a position with the National Weather Service in Wilmington, Ohio. There is no doubt in his mind that his experience at Innovative Weather prepared him and opened the door for his current position. 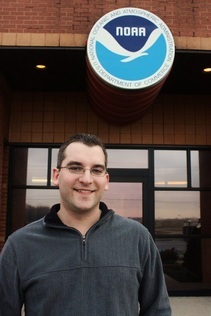 He says, "Working in the National Weather Service isn't just about forecasting the weather. There is a lot of interaction with customers, whether it be the public, event organizers, or heads of other government agencies. Innovative Weather helped me learn how to concisely articulate the most important facets of a complex forecast scenario in order to meet a client's specific needs." Aside from launching weather balloons and forecasting, one of his favorite aspects of his current position is venturing outside the office to interact with NWS customers at outreach events. In his spare time, Mike enjoys traveling to various historical and scenic sites and playing Celtic music on his fiddle. Growing up in Beaver Dam, WI Zach Uttech was always fascinated by the day-to-day and season-to-season volatility of weather. He quickly developed a passion for winter weather and had a desire to understand why snowstorms and other meteorological phenomena occurred. 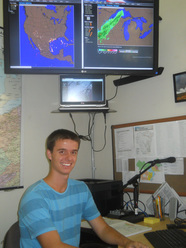 Zach received his undergraduate degree from the University of Wisconsin-Madison, then came to UW-Milwaukee to complete his Masters and work at Innovative Weather. He was with IW from November of 2011 until April of 2012, when he completed his graduate study. 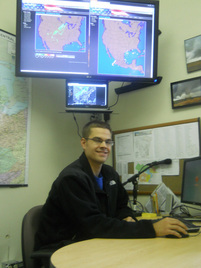 During that time, Zach worked many severe weather situations, but one in particular stands out. “My most memorable forecasting experience at IW was when a bow-echo squall line of thunderstorms moved across southern Wisconsin during the summer of 2011. This line of severe storms produced wind gusts over 70 mph and frequent cloud-to-ground lightning strikes. For this specific event, we were able to forecast, for our clients, the potential for severe thunderstorms several days in advance which allowed them ample time to prepare. It was a very rewarding experience when I saw our forecasts come to fruition and we were able to notify Lake Express (one of our clients) of the impending danger a few hours before it arrived. Provided with this information, Lake Express moved their ferry away from the Lake Michigan coastline before the severe winds hit -- thereby preventing potential damage from rocks and other near-shore obstacles.” Zach was immediately hired as a Meteorologist Intern at the National Weather Service office in Great Falls, Montana upon completion of his Masters. 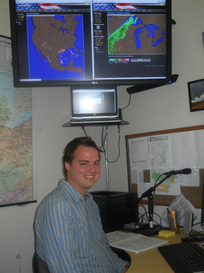 Michael Hansen graduated with a Bachelors of Science in May of 2011, and worked with Innovative Weather from June 2009 through July 2012. Like many other meteorologists, Michael has had an innate fascination about the weather for as long as he can remember. His most memorable experience was the night of the July 22nd floods in 2010. After commuting back from the National Weather Service from his internship during the storms, he had to work the overnight shift at IW. In addition to working with a very tense situation, I got to do my first impromptu phone interview with WUWM. His time at Innovative Weather was very valuable. He says “IW was able to help me prepare by giving me experience in an operational setting. I really wasn't interested in broadcast meteorology, but I wanted to get into the scientific aspect of forecasting the weather for clients or the general public.” Michael is currently working for Wilkens Weather Technologies, a subsidiary of Rockwell Collins, as a Marine Meteorologist. His tasks include forecasting and risk assessment for shipping routes and oil drilling across most of the world. I received my B.S. in Atmospheric Science in May of 2011 and am currently a Masters student working with Professors Paul Roebber and Clark Evans. Upon completion of my M.S. in Atmospheric Science in May of 2013, I plan to either work towards my PhD or find employment in the research sector that focuses on operational meteorology. I chose UWM because of its diverse and well known faculty within the University and the Atmospheric Science program. I have been with Innovative Weather since June of 2009 and most enjoy analyzing complicated forecast situations, particularly those involving severe weather and winter storms, and having the opportunity to communicate the weather impact to private client operations and the public. I am a lifelong Packers, Brewers and Badgers fan and in my free time I enjoy storm chasing, mountain biking, running, downhill skiing and surfing. I began working at Innovative Weather in early September after returning for my final year in the Atmospheric Science M.S. program. Since graduating with a B.S. in Atmospheric Science in 2009, my experience has mainly encompassed weather modification for both governmental and private clients. Innovative Weather is giving me the skills and basic on the job experience that an employee at a standard operational forecasting company is expected to have. Upon graduating, I hope to work in an environmental field, in hydrology, or in LGBT advocacy. I occupy my spare time with writing, reading, and enjoying the alternative art scene in Milwaukee. I graduated from UWM with a B.S. in atmospheric science in May of 2012, and I am now working on my master’s degree in atmospheric science at Colorado State University. I’ve had a fascination with science and nature for as long as I can remember, and my interests evolved with rock collections, space posters, and dinosaur books. Finally, in about fifth grade, I discovered meteorology and never looked back. I joined the Innovative Weather program in June of 2010 as an intern, and ended a little over a year later, in September of 2011. It was a hard decision to leave, but I felt a strong pull towards research in the topic of air pollution, sparked by a study abroad trip in January 2011 to Mexico to examine the effects of air pollution on the ancient monuments spread throughout the country. This is what I continue to study at CSU. I consider Innovative Weather my first “real” job in the sense that I had the opportunity to deal with real, paying clients and experience both rewards and consequences created by the service I gave, all based on theories I learned in the classroom. The maturity I experienced while working at Innovative has been invaluable and I still use the critical thinking skills I learned to this day. A very vivid memory for me is actually a collection of multiple occasions when severe weather was likely to strike our client’s service areas, only to hit just outside of our forecast zone. I recall the built-up tension and nervousness all suddenly alleviated (besides having to explain to the client why we made such a dire forecast, of course), reminding me just how young and imaginative our field truly is…and how far I was from mastering the science of weather forecasting.